"And He said unto them, Go ye into all the world, and preach the gospel to every creature" Mark 16:15. At the heart of God is the great commission to go into the world, whether it be across the globe or across town, and share the good news of the Gospel of Jesus Christ. Your decision to give to the Faith Fellowship Ministries missionary efforts, when mixed with faith, opens the door for God’s financial supply in your life, and releases the anointing on this ministry to you. We sincerely appreciate your giving and feel privileged that you have entrusted us with the honor of sharing the good news of Jesus Christ through the following outreaches. What an honor it was for Pastor Joe to share the message of God's unconditional love and grace at Comunhão Cristã Abba for their Second Annual ABBA Conference in the beautiful city of Curitiba - Panara in South Brazil. It was an amazing success and truly a life transforming experience that exceeded all expectations. The conference began on Friday night and all day Saturday, culminating with two power-packed services on Sunday. Thousands of people joined the Sunday services, of which I shared a message on "Spirit, Soul and Body" in the morning, and "The Savior Who Seeks the Imperfect" in the evening. The theme for the conference was "IDEM" which in Latin means "the same, or me too". Each of the speakers focused on our identity In Christ. The praise and worship was absolutely crazy with hundreds of young people dancing singing and just plain going over the top with extravagant adoration for Jesus. The sights and sounds were a visual and spiritual experience with scenes on the large screens, depicting creation all the way through the resurrection of our Savior. All in all. It was a life changing experience that touched the lives and hearts of all that were there! What a powerful two weeks of ministry in the beautiful nation of Malaysia. Pastor Joe and Natalie were honored to be invited by Pastor Peter and Seefen Sze of the New Covenant Church (tNCC) in Kuala Lumpur to share the good news of God's goodness and grace. In a nation that is 90% Muslim, tNCC is proclaiming the finished work of the cross of Jesus Christ, and is the largest “grace” church in the country. Over the course of the visit, Pastor Joe shared his journey with the tNCC leadership, preached at the midweek service, shared at a youth gathering, a businessman’s weekly fellowship at TA Global, and finished with the privilege of being the keynote speaker at the Family Camp in Malacca. Over 600 registrants gathered for the very special annual event, with the theme this year of “Grace Immersion”. Pastor Joe shared five sessions on “Spirit, Soul & Body” and “The Miracle Rod of Grace”. Lives were changed, people were healed, and new friendships were forged in this God ordained missionary effort. Thank you to everyone who prayerfully and financially supported Rev. Natalie Fortunato for her mission trip to Paris, France in May, 2016. Natalie joined Terri Savelle Foy and her team on their eighth ministry tour to France, whose vision is to reach out and impact 20 cities in France by 2020. 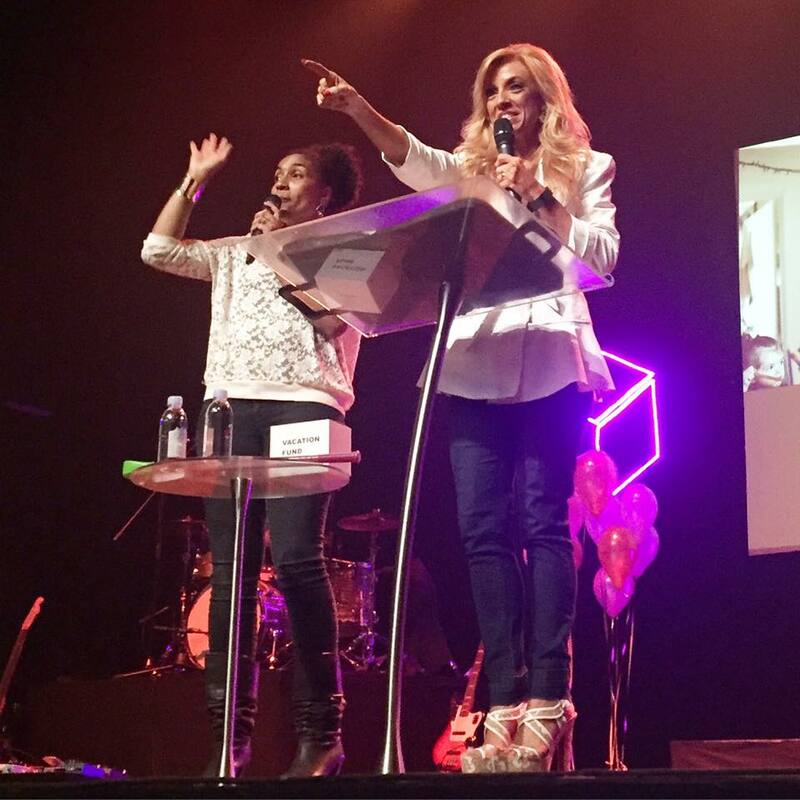 When Terri shared her vision for France during a Women's Conference at FFM in 2009, Natalie made a decision that one day she would minister alongside Terri and her team and be a part of something this powerful. By God's goodness and grace, her dream was finally realized. Enjoy the photo summary of the trip to the right. And the gospel must first be published among all nations. Mark 13:10 Terri Savelle Foy Ministries has translated the following ministry books into French: You’re Valuable to God, Make Your Dreams Bigger than You’re Your Memories, My Personal Dreams and Goals, Untangle: Break Wrong Soul Ties and Pursue Your Purpose, and Imagine Big... and regularly adding new teachings with French translation to their website as they reach out to French-speaking people all over the world. Over 22,000 copies of Terri’s French translation book, You’re Valuable to God have been given away on the streets and ministry events during their tours in France. What a memorable moment on the first day of ministry, as the team of 11 gathered to pray over the nation of France from the Eiffel Tower. What a perfect place to call in the 20 cities in France that Terri is believing God to minister in by 2020. Each morning the team was given a stack of You are Valuable to God books written by Terri and translated in French. As the ministry tool of this mission, over 1600 books were handed out, sharing the good news of the gospel of Jesus Christ. The 2016 missionary team was made up of TSFM partners from Texas, Florida, California, New York and New Jersey. Women from all different backgrounds and stages of life came together for a single focus, to share the love of Jesus with a primarily non-Christian nation. Each day was a different venue throughout the city, wherever crowds were gathered. The team walked miles and miles each day to reach the precious people of Paris. The response to the books from the French was very positive and inspiring, as most people received their book with a "merci" and a smile. One last highlight, and the final stop of the trip was attending Hillsong Paris church for a Sunday service. As the guest speaker, Terri ministered about following your God-given Dreams and Goals, something that is not commonly spoken of in this culture. Once again, the response was overwhelming by those in the city, and followers outside the city that traveled to hear Terri speak. It was awesome to worship in French! It also happened to be Mother's Day that Sunday in France, so Natalie was doubly blessed by the festivities on this special occasion. Thank you for partnering with Pastor Joe as he traveled to the Metro Manila area in early December, 2015. His mission was to share the good news and the Gospel of Grace with this precious nation, which is currently over 85% Roman Catholic. All we can say is "mission accomplished". Over the course of 10 days, he joined Rev. Ronn Constable of Faith Fellowship Ministries World Outreach Center to minister in local churches. Including Jesus Faith Christian Fellowship (JFCF) in Las Pinas City, and satellite campuses in Calooncan City, Life Giver Church in Pasig City, Damarinas, Tagaytay City, and various other venues. Pastor Jun Yu of JFCF also arranged for Pastor Joe and Brother Ronn to serve on a Grace Panel to invite open discussion on the many faceted topics of faith and grace. Signs and wonders followed the Word as people were healed in their bodies, and set free in their minds from religion, legalism as well as the destructive doctrine of "Universalism". After preaching 10 times in 11 days, the trip was topped off with scuba diving (a first for Pastor Joe) with fellow pastors in the beautiful Anilao. Pastor Joe sincerely appreciates your giving and feels privileged that you have entrusted him with the honor of sharing the good news of Jesus Christ through Mission Possible Philippines.